Opening in Second Life at the Rift Horizon Gallery on Wednesday September 3rd at 08:00 SLT is an exhibit by Chance Acoustic entitled A Room for Ferrisquito, featuring elements of Bryn Oh’s work from the period 2008 through 2011, and which will be marked by a special presentation by Art Blue. The room is situated over the gallery, so if you arrive at ground level, use the teleport sign to reach it. The oval room offers an intimate display space, with images of Bryn’s work, as photographed by Chance, framed around the curved walls, and The Consumerist Sherpa sitting on one side of the floor. Overhead, the Beetlebot presides from a high perch, watching everything. However, the focal-point for the exhibit is Ferrisquito, an angelic-appearing character, who can be summoned via a wall panel close to the “door” into the room. When summoned, he’ll acknowledge in chat, then duly arrive and stand on a pose ball. Once there, he’ll rez elements of Bryn’s work, displaying them on the floor space around him and sometimes overhead in the upper gallery area which can be reached via the staircase, allowing them to be viewed and examined by visitors. 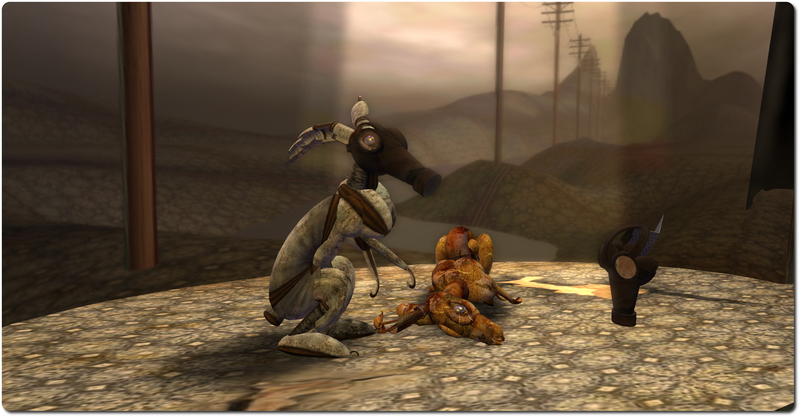 In all, there are 25 3D pieces of Bryn’s work to be seen, comprising: Under the Poumbrella [poembrella], Mayfly machinima, Downloading …, The Violinist, Run like a fawn, Run Rabbit Run, Mother, Feed me, Steamdragon, Wee little Steamclock, Standby, Carriage, Consume, Poumbrella, Pouncing Fox, Confused eyes, Bryn Oh´s bicycle, The Rabbicorn, 26 Tines, Cerulean, Willow, Angler Girl, The Violinist and Nightmare. Ferrisquito himself is a reference to the icon representing the robot theme park featured in Immersiva, while the room in which the pieces are displayed is seen by the Art Blue and Chance as a time capsule, designed to keep the pieces forever safe and available for display for as along as Second Life exists. In keeping with this idea of time, the exhibit’s opening will feature a short play by Art Blue entitled Knowing. Lasting 20 minutes, it involves a story of time travel, an attempt to uncover the secrets of life, and the discovery of Bryn’s work; all of which is narrated by an owl, Nervual. 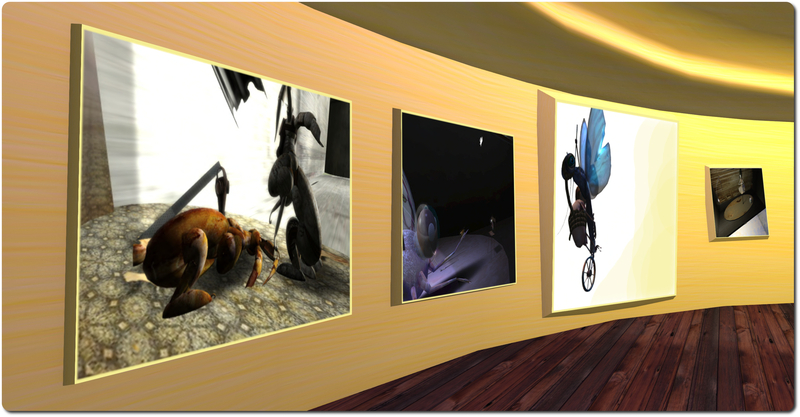 Following this, visitors will be invited to enjoy Chance’s images of Bryn’s work, and witness the arrival of Ferrisquito, ready to reveal the 3D pieces he carries with him. Visitors will also be invited to collect a special book of images and text from the exhibition as a keepsake of their visit. Following the opening of Ferrisquito in Second Life, Art Blue will also be hosting an exhibition on Metropolis grid featuring the room, together with two of Bryn’s 3D pieces – the Beetlebot and the The Consumerist Sherpa, – for which he has had special permission to transfer to Metropolis grid. 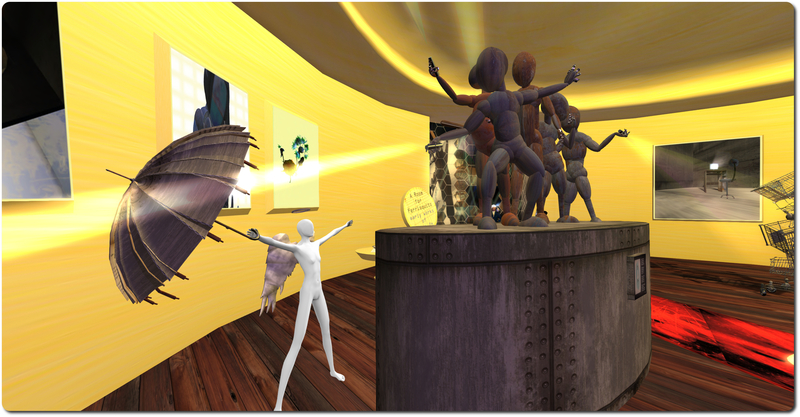 The exhibit will form part of his Vulcanicus OpenSim art time capsule. This opening on Metropolis grid will be marked by a special event in which Art Blue will call the room and its surroundings into existence before his audience, the artist giving form to a new “world”. Those wishing to attend the event should contact Thirza Ember via the HG Safari Facebook group, as sitting is limited for the performance.